Emma Gambino (Anthony's sister) married a man named Frank Laport (Liparota). 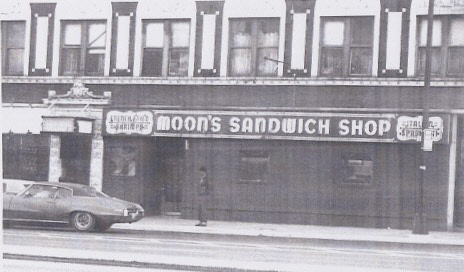 They opened a Moon's at 1649 W. Roosevelt Road in 1936. It closed in 1982. Frank ran the business until his death in 1967. His sons Charlie and Frank Jr worked for him after WWII and ran the business until it closed in 1982. Charlie passed away in the mid 90's and Frank Jr passed in 1997. 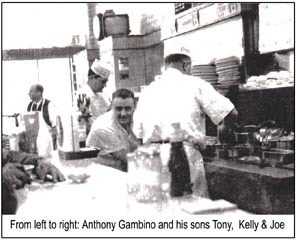 Mike Gambino (Anthony's brother) opened the third Moon's locations at Grand and Crawford (Pulaski) and in the 1950's he moved it to Chicago and Hamlin. Mike had a son named Joe (BeBe). I believe the Moons at Grand and Crawford was also opened sometime in the 30's. Rose Gambino (Anthony's sister) married Peter Canzoneri. Their son Joe (di Rose) and his cousins Joe (di Nina) Canzoneri (son of John and Nina Canzoneri) and Sam Manfre (son of Frances Canzoneri and Salvatore Manfre) all worked for Mike Gambino at his Moon's on Crawford and Grand in the 1940's. 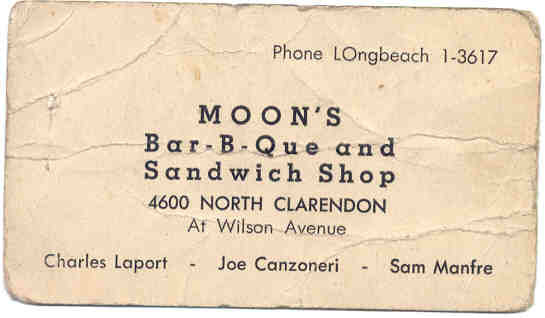 In 1948 Joe (di Nina) Canzoneri, Sam Manfre and Charlie Laport opened a Moon's at Clarendon and Wilson. This location was closed in 1951. Charlie then went back to Moon's on Roosevelt Rd. Sam Manfre went to work for Tony Lagori at Chicago and Cicero Ave's and eventually bought the two Lagori's locations with his partner Vince Marotta (Tony Lagori's son-in-law). Joe (di Nina) went to work selling parts for IBM for their early computers which led to a very successful career in the computer business. Joe (di Rose) became a Chicago Police Officer for many years. Anthony Gambino Sr. opened the first Moon's in 1933, located at 16 S. Western Ave. Anthony had four brothers Mike, Salantino (Slantz), Willie and Jimmy, and three sisters, Emma, Sarah and Rose. Anthony Sr. had three sons Anthony Jr.(Tony), Joe and Kelly. Anthony Jr. ran the Western Ave. location with his brothers from the time he got out of the Army after WWII until he took on a partner Jimmy Radek (current owner) in 1979 and then sold it to Jimmy in 1989. Anthony Gambino Jr. died October 17, 2003 at his Florida home of cancer. His brother Joe died in 1978 and Kelly retired in 1981. Nicknames were a common thing with the Gambino's like many Italian & Sicilian families. In tradition sons were named after their grandfathers. And with so many children having children in those days, there could be dozens of Joe's in a family, thus the reason for so many nicknames! Slantz Gambino's son Lucien (Lu) was a pro football player on the Baltimore Colts (1948 & 49), and Joe was a semi truck driver. Willie Gambino was a sports bookie and a big stock market investor for many years. Emma's son Joe went into the waste management business in Chicago Heights, Illinois. Tony Gambino III owns the Taco Fresco chain in Chicago. Who (Gambino/Antonucci) owned Cook County Mobile Home Park? Anthony Jr. married Rita Lorry, had four children, Veryl, Rita, Mary & Tony III. Joe (oldest son) married Charlotte, had two daughters: JoAnn & Diane. Kelly (middle son) married Virginia, had two daughters: Ginny & Bobby. Emma (Frank Liparota/Laport) son: Charlie (opened Clarendon and Roosevelt locations). Emma also had sons named Frank and Joe and daughters named Josephine and Mary. up owning Skyline Disposal company of Chicago Heights. Joe passed away in 2008. Charlie married Marie and had three children: Charles, Robert and Barbara. Rose (Canzoneri) Married Peter Canzoneri. Had two sons Joe and Peter Jr.
Salantio (Slantz) was a barber. Children: Josephine, Lucien (Lu) and Joe. Sarah (Antonucci) Children: Charlie & Joe. ** We need street address and dates of operation. Please let us know if you have any information. Where did they get the name "Moons"? Word has it that they were in the business of making moonshine during prohibition... thus the name Moons! Here is an interesting article (we just found) from the Chicago Tribune that ran in 1965 about a woman named Florence Gambino. (Florence was the wife of Willie Gambino. Willie was a sports bookie and a very successvul stock market investor. Florence was arrested for operating a gambling wireroom. She was trying to raise money for her brother-in-law Joe (Bebe) Gambino to pay off his juice loans. It confirms the address of the Chicago & Hamlin location. Willie passed away in October of 1988.